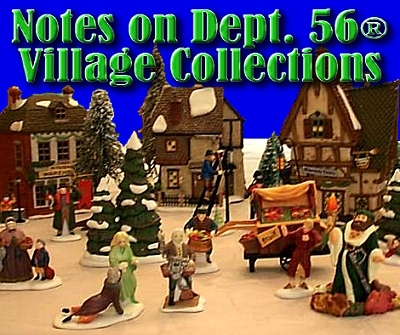 This is a small collection of personal observations about Department 56® village collections, including many that I had to leave out of the "A Brief History of Christmas Villages" article for reasons of space. I am not a Dept. 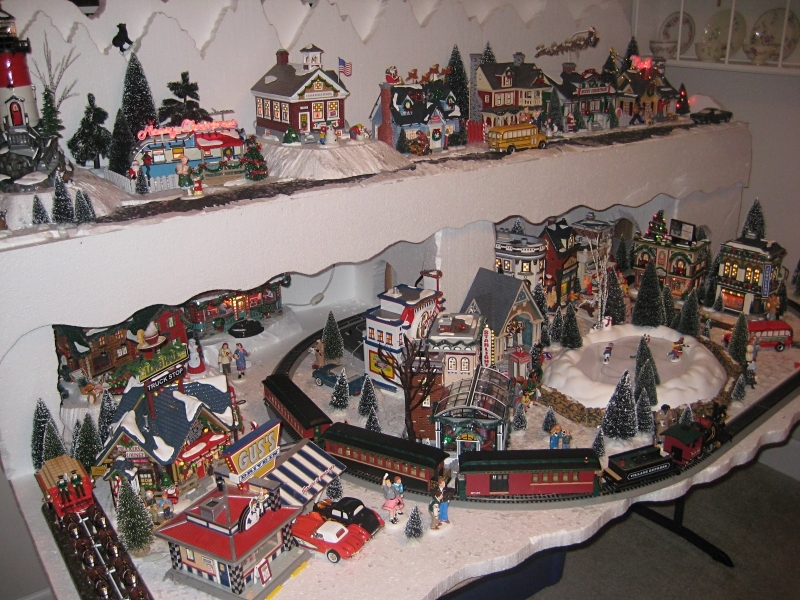 56® collector, simply a person who admires many of their products and owns a few that I use with my own Christmas villages and seasonal railroads. So you may very well know quite a bit more about Dept. 56® and their products than I do. So please, feel free to send me any corrections or additions, and I'll try to update this page in a timely manner. 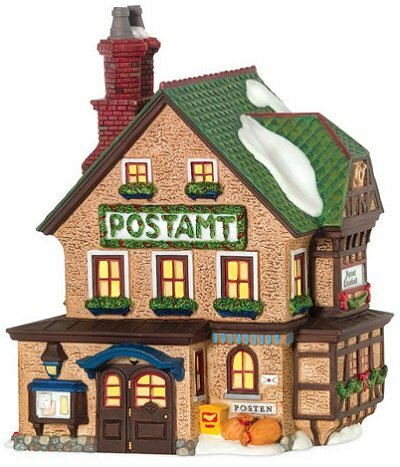 In 1976, Department 56 introduced with six ceramic buildings that caught holiday decorators' attention, revived Christmas villages, and started an industry. 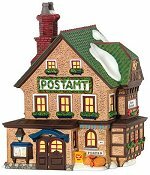 It's worth mentioning that, while "Christmas village" and "Holiday village" are generic terms, "Dept. 56" and their trade names, including "Snow Village" are specific brand names and trademarks of the Dept. 56 company. 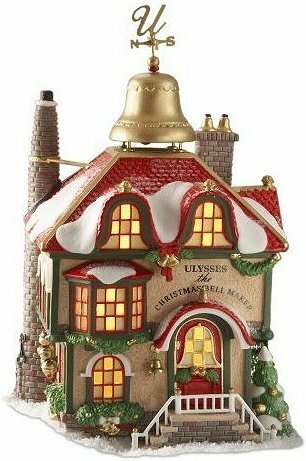 By now families that used to set out those glittered cardboard Christmas houses or tinplate train sets were leaving them in the attic, for many reasons, including lack of space. But you could squeeze a Dept. 56® display in just about anwyere, and it wasn't long before many folks were doing just that. Since 1976, Dept. 56 has constantly increased the quality and variety of their offerings. The most popular series and collections include the following. The six 1976 "Snow Village®" structures were retired in 1979, and replaced by twelve new structures. That line is now called "The Original Snow Village®" and continues to retire and introduce buildings and accessories. 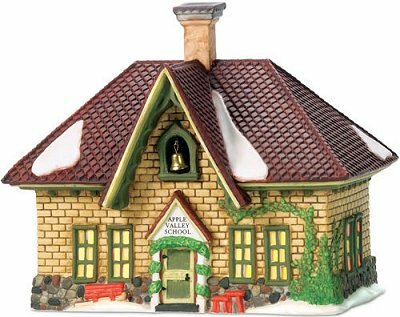 In 1986, the Heritage Village Collection expanded to include the New England Village Series® and the Alpine Village Series®. 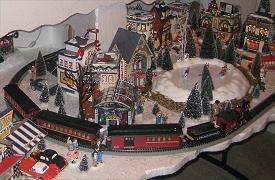 In 1987, the Christmas in the City® series was added to the Heritage Village Collection. In 1990, the North Pole Series™ was added as well. The following table shows samples from each of these series. It's hard to look at the list above and remember that the Dept. 56 people think of all of these series as belonging to only two "collections." After all the Heritage Village Collection® includes a huge diversity of time and place. But a few generalizations can be made about the two collections. 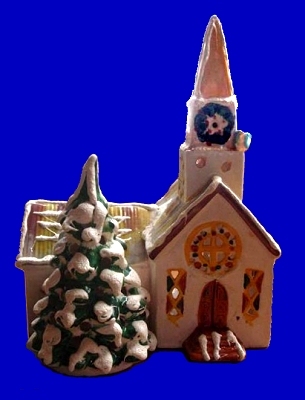 The Original Snow Village® collection has retained its ceramic "roots" - many of the structures and accessories still have parts that are shiny like a cookie jar. 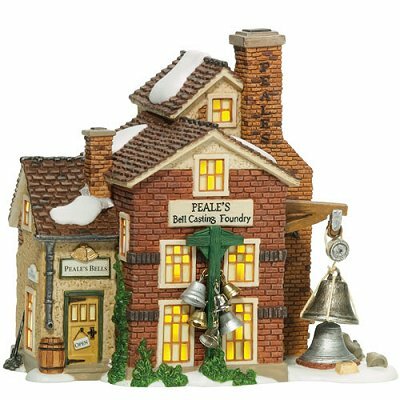 This collection also averages a bit larger in scale than the Heritage Village Collection®, even though the overall size of the buildings is similar. That is because the Original Snow Village® buildings tend to be modeled after smaller structures than the Heritage Village Collection® buildings. So they can make them larger in "scale" but keep the same overall size. One way you can tell the difference is by looking at the size of the doorways - another way is seeing how many "stories" high the buildings seem to be. Speaking of scale, many Dept. 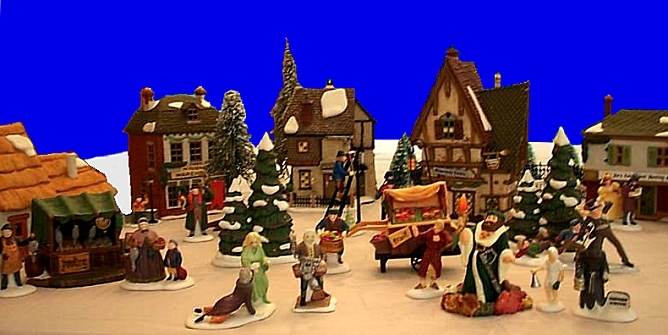 56 fans think that the Original Snow Village® buildings go well with O scale or O gauge trains (including Lionel). The Heritage Village Collection® includes all of the other village series. Its structures and many of its accessories are made of a kind of porcelain that has a more "satiny" finish, like what they used to call "bone china" when I was a kid. 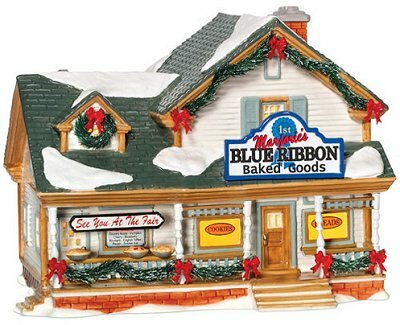 In addition, the Heritage Village® buildings tend to be a bit smaller in scale than the Original Snow Village® buildings. Many of the buildings have three stories or more, yet the buildings are not substantially larger overall than the Original Snow Village® buildings. Dept. 56® fans think that the Heritage Village Collection® structures look good with HO trains. One thing is true across all of the Dept. 56 collections: the figures are all bigger than they "should be" to go with the buildings, so they definitely look too big compared to HO trains. That leads us into the next subject. A market for trains and train-related products to go with Dept. 56 communities emerged soon after the first village buildings were available. But Dept. 56 doesn't have the facilities to make their own electric trains. After issuing two HO-scale trains that didn't really catch on, Dept. 56 finally contracted with Bachmann, one of the world's largest model train makers, to issue a new line of trains that would look right with both the Dept. 56 structures and the Dept. 56 figures. Although the Dept. 56 Village Express is no longer made, the On30 trains that Bachmann developed for Dept. 56 are still available (and they still go great with Dept. 56 villages). 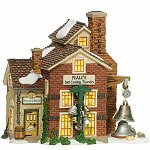 Hawthorne Village® offers many limited-edition collections based on art from Thomas Kinkade and many others. These collections come one piece at a time by subscription. Click on the picture to the right for more information. For more information about trains to go with Dept 56® villages, check out our article on Department 56® Village Trains. Many more things can be said about Department 56® collectibles - again these are just personal observations on subtopics we found interesting. If you have any information you'd like us to add, or any corrections, please contact us. In the meantime, please have a great Christmas season. What do Trains Have to do with Christmas? All information, data, text, and illustrations on this web site are Copyright (c) 2006, 2007, 2009 by Paul D. Race.